The Artistic Director of Theatr Clwyd, Tamara Harvey, has announced full casting for the world première production of ‘The Assassination of Diane Abbott’ – a new musical from Chris Bush and Matt Winkworth. A shocking crime divides the nation. 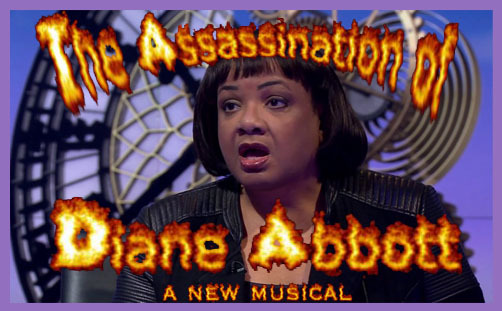 Diane Abbott had long been reviled by racists and abused by the right-wing media. Fingers are pointed, sides are drawn, facts are hard to come by. Why did this happen? How do we move on? What must we remember? It’s easy to have an opinion online, safe behind the anonymity of a keyboard – just ‘like’, ‘share’ and ‘subscribe’. But as the digital mob polish their pitchforks, the world starts to question just how free should free speech be. Left-wing journalist Caitlin Moran wrote in her Times column: “This has totally zapped my ovaries. Theatr Clwyd has been occupied by Zio Nazis who despise everything that Diane Abbott stands for – tolerance, love, peace, justice, fairness and a total ban on plastic in Hackney. This isn’t theatre: it’s an abuse of freedom, and needs to be shut down.” The non-binary political activist Jack Monroe said the play was just “homophobic, transphobic, deadnaming and ignorant”. The new musical is actually called ‘The Assassination of Katie Hopkins’. This is exactly what the theatre is for. It’s by far the best way of exploring issues of truth, celebrity and public outrage. How does a crucified stormtrooper glorify God?